Scary Monsters magazine #108 - Outer Limits Monster Menagerie - HUGE 176 Pages! 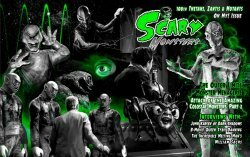 MyMovieMonsters.com > Scary Monsters Magazine > Scary Monsters 101-Current > Scary Monsters magazine #108 - Outer Limits Monster Menagerie - HUGE 176 Pages! The 108th Thetans, Zantis & Mutants Oh My! Issue a whopping perfect-bound 176 pages! "There is nothing wrong with your television set. Do not attempt to adjust the picture. We are controlling transmission. If we wish to make it louder, we will bring up the volume. If we wish to make it softer, we will tune it to a whisper..."
These immortal words of the "Control Voice" began the unsettling opening narration of each episode of one of the most celebrated TV series of all time: The Outer Limits. Scary Monsters 108th Thetans, Zantis & Mutants Oh My! Issue highlights in its 176 vintage pulp pages the sometimes terrifying and always curious monsters and creatures that took over viewers" TV sets from 1963 to 1965, and beyond. There are lots more scares, including award-winning Dr. Gangrene's Mad Interviews, Kaiju Korner, Strange Days, Weird USA and more! Collectors Note: If you want your issue bagged and boarded (placed into an archival quality "bag" with white backer board), click on the drop-down menu above to select this extra service. Here is Dr. Gangrene's sneak preview of Scary Monsters #108!